Search Marketing > SEO > Can Marketing Survive in Europe without IT? Can Marketing Survive in Europe without IT? The following post is courtesy of Ale Agostini, managing director of Bruce Clay Italia. In this post, Ale talks digital marketing in Europe and the progression of the marketing role, which is now beginning to require traditional marketing knowledge mixed with an understanding of technology. 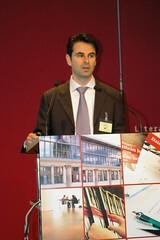 On April 7, Ale spoke on “SEO for Publishing Companies: 5 Best Practices from the U.S.” at SIPA Munich 2011, a conference by the Specialized Information Publishers Association. In his post, Ale discusses takeaways from the conference and gives us a look into some of the issues Europeans face with the online marketing role. Marketing is changing rapidly in the new millennium. New marketing and advertising channels such as Google, social media, mobile apps and more, have risen up alongside traditional media like TV, radio, the press, etc. These new channels must be effectively integrated into the marketing mix. In order to do this, however, marketing managers have to acquire the necessary IT skills associated with this new digital media. This notion was apparent at the SIPA Munich 2011 conference this year. The digital media revolution and need to adapt to it is probably nowhere more apparent than in the news and publishing industries. The StateofMedia.org recently reported on the state of the U.S. news market: the Web is now the second most popular source of news next to television. With the new digital medium coming in at second place, and advertising spend on this channel rising, traditional marketing roles in many industries across the world will soon be replaced with what I call “Mark-IT”: a new marketing management role that merges marketing skills with IT knowledge. This is the expertise required in order to use and develop new advertising and online marketing channels such as Google, Facebook, the iPad, the mobile sector and more. This is a conclusion I came to after attending the SIPA Munich 2011 international conference. For 30 years, SIPA, the international trade association dedicated to publishing, has been connecting publishers across continents. I have been reflecting on the topic of the developing marketing role in business for a while now, but takeaways from SIPA Munich this year led me to solidify the idea of the “Mark-IT” role. Let’s take a look at some of these emerging ideas from the SIPA Munich 2011 conference. During an interesting presentation, Richard Londersborough of Monitor International explained how the success of his company can be attributed to the expansion of the in-house IT team (from one person to 25 in just a few years) and investments in new digital media. However, Richard also underlined that investing in the sales department is still critical: “I don’t want my company to be led by computer programmers and technicians,” he declared. I mulled over this statement for more than three days before coming to the following conclusion: Richard knows that in some departments, the role of and the knowledge related to IT has become more critical than marketing. The second, very apparent takeaway from the SIPA Munich conference is that even very traditional sectors like specialized publishing are showing a need to take advantage of new digital media. Many presentations by international publishers showed just what can be done by embracing new online marketing and advertising channels such as Google, Facebook, the iPad and more. The only limitation to implementing new online marketing tactics is the level of professional training, or lack thereof. For instance, Helmut Graf, chief executive officer of VNR, explained the difficulty that many German companies are facing in finding marketing managers who have complete knowledge of new media tactics such as search engine marketing or social media. I had already found this to be the case in the Italian market, but didn’t think it would be the same for the German market – a market in Europe that’s extremely well-positioned. This made me realize that we are in a transition phase in which the “older generation” of marketing managers do not have the technical backgrounds to understand how to best make use of platforms like Google or Facebook, and the new graduates in marketing and communications do not have the experience to evaluate strategically how new digital media can help the company grow. So, from this need, the marketing manager in the new millennium must align with the concept of the “Mark-IT” — a new managerial discipline that’s a cross between traditional marketing and the tech-savvy professional. Someone who can create and manage progressive digital marketing tactics for businesses across the globe. Alessandro “Ale” Agostini is managing director of Bruce Clay Italia, bringing with him years of experience as a marketing executive and specialist for leading European firms such as Ferrero, Campari and Bolton Manitoba. Ale is a frequent guest speaker for organizations such as the IULM University, Radio Rai, Eba Forum and Bocconi University, and holds a degree in Business Administration. You can connect with Ale on LinkedIn. The basic principles of marketing has not really changed as of yet, but there is an hugely added component and that is Internet Marketing. Today it is even impossible to imagine marketing without IT technologies. no i don’t think it so .. every and each country needs IT for its normal markeetting also . today in this world computerization takes place . and in this case how can market survive without IT. anyway your blog is fine . thnx for showing interst in this new topic. I feel that, without IT, marketing survive is not possible. Really it is correct, marketing is changing rapidly and updating new informations. Thank you for sharing this conference information.